Ever since my copy of iLife ’08 arrived this afternoon, I have been attempting to determine whether Steve Jobs was telling the truth as to how “cool” all the new features are. After several hours of arduous product testing and evaluation, I have come to a difficult decision: you better believe it is! Ok, seriously, iLife ’08, the release of which was announced by Jobs at an Apple special event on Tuesday, is a very nice upgrade to the entire iLife suite (at to the apps I use). This isn’t intended to be an exhaustive review, so I’ll only touch briefly on each of the iApps, excluding iWeb, which I have never even used, so I don’t consider myself qualified to comment on it. Let’s face it, iPhoto ’06 was just lousy, especially when compared with the strong competition given to it by Picasa on the PC. However, iPhoto ’08 has significantly reduced or eliminated the number of headaches I encountered while managing my photos. The first improvement is speed. Scrolling through my photo library (which, albeit is rather small, consisting of only about 700 photos) is lightning quick, with no lag at all. The “events” features is also an incredible improvement over the “rolls” based system used in iPhoto ’06. They are a much more logical user-friendly way of organizing photos, and the events index (shown below) is a fantastic way of quickly looking through all your photos. Furthermore, the “skimming” feature demonstrated by Jobs in his presentation, where dragging the mouse from left to right across the event thumbnail quickly flips through all its photos, really is as fast and cool as it looks like! 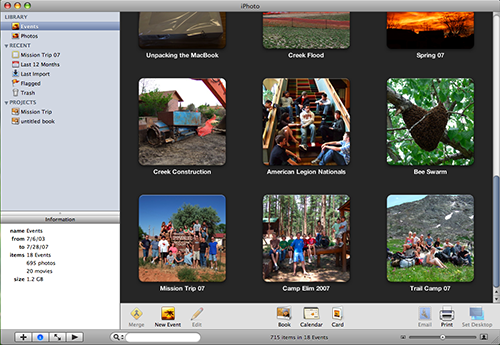 One final improvement in iPhoto ’08 is to the way photos can be moved between albums/events. In iPhoto ’06, a photo had to be dropped directly onto the title of an album to move it, but now it can be dropped anywhere in the album. This means no more dragging an imported image up past 200 photos just to move it into the proper album. Although iMovie ’08 has been the subject of much controversy, with many people claiming it is even a downgrade from iMovie ’06, I believe it is a great improvement. Honestly, iMovie ’06 never made much sense to me, titles were difficult to use and couldn’t be edited after being applied to a clip (or maybe I just couldn’t figure out how). A simple video taken with my digital camera would have to be “imported” to be used, a process which generally took about as long as the clip itself, and the program seemed generally slow and unstable. In contrast, iMovie ’08 is extremely intuitive, easy to use, and lightning quick. Its video skimming feature is a joy to use, and is just as fast as in Jobs’ demonstration. Being able to simply select video segments and drag them into the timeline makes creating videos fast and easy. The program’s set of transitions, although small, is adequate and includes all of the most commonly used and professional looking favorites, such as cross fades and fades through black or white. Titles are quick and easy to apply, and can be edited afterwards just as easily. On the downside, it is true that iMovie ’08 lacks any video effects (besides color correction) and does not allow the volume to be faded up and down inside a clip, although the audio level of each clip as a whole may be adjusted. Themes are also gone, although I personally never used them and won’t exactly miss them. Rather than considering iMovie ’08 a “downgrade” from ’06, I would prefer to think of it as a “crossgrade”, if that is even a word. Although it does lack some of the editing power of iMovie ’06, it more than compensates for these deficiencies with what it gains in usability and speed. I don’t have much to say about iDVD, besides that it is probably the most routine upgrade in the entire iLife ’08 package. Besides a few performance and usability enhancements, there really isn’t anything to exciting in it, although the new pro-quality encoding is probably exciting to some. Other than that, iDVD remains an incredibly easy way of creating high-quality DVDs quickly and easily. What more could one want? The iLife ’08 upgrade to garageband doesn’t appear to add anything too spectacular, although the magic garageband is rather fun to play with, even though it may not actually be very useful in composing actual music. It has some minor interface enhancements, and the arrangements feature will probably be useful in some instances, although I don’t know how often bands will simply swap verses around in a song. I am not exactly an expert in using Garageband, so I honestly don’t know how useful any of the new features will really be to those who actually record music. Overall, iLife ’08 is quite a significant upgrade to the iLife suite, one which I think is well worth purchasing for the improvements in iPhoto alone. Although iMovie is still in its first version and lacks some power features, I believe that over time it will mature into an excellent editor for simple films and home movies, although its usefulness for making more advanced videos is severely limited. The changes to the other members of the iLife bundle are of less significance, although they are still useful in some ways. But, you ask, should I buy it or not? I would reply with an unequivocal, probably ;). If you disliked iPhoto and iMovie ’06 as much as I did, then definitely yes, go buy the upgrade. But if you are satisfied with those two programs, the upgrades to the rest of the suite most likely aren’t significant enough to warrant immediate adoption. This entry is filed under Apple, General. You can follow any responses to this entry through the RSS 2.0 feed. Both comments and pings are currently closed. Well, you sure didn’t wait long to buy it Connor! I’ll agree with you that iPhoto is definitely the big news here. iPhoto 6 worked if you only took a few pictures a year….but just wasn’t suited for mid-to-large-scale photography. It sounds like Apple has overcome many of their problems with this new release. Regarding iMoive, I never had any problems with it. ðŸ˜€ I have been hearing very mixed reviews. “Crossgrade” is probably the right way to describe it…..I may continue using iMovie 6 even after I upgrade. Thanks for the great review! Nice! I made friends with one of my classmates today, named Scrat (okay, nicknamed Scrat), who carries around a Mac and uses GarageBand. What IS it with you Mac lovers? ðŸ˜› But seriously, I was quite impressed with what he did with GarageBand while we were sitting in English class!